When the The New Yorker editor William Shawn was an adolescent, he nearly became the victim of a gruesome crime: a schoolmate of his was kidnapped and bludgeoned to death; when the murderers were brought to court, it emerged they had once considered killing Shawn instead. Shawn reacted to the horror of having dodged death so narrowly by developing a host of phobias. He couldn’t tolerate the sight of blood and the discussion of diseases, and he always carried a hatchet in his suitcase, in case he got trapped in an elevator. His sense of dread weighed down particularly on his son, who as an adult would find himself eerily inflicted with many of his father’s phobias. Last year, as news broke over Queen Elizabeth’s unguarded comments on the rude behaviour of Chinese officials at President Xi Jinping’s state visit to her country, I remembered the Shawn story, for I used to turn to it again and again when I held a job that required me to be at the beck and call of mainland business people of some clout. Each night, as I got back home bone-tired from catering to their flurry of demands, it was up to me to talk myself out of self-pity, to dispel the gloom that it was – to quote the Queen – “bad luck” to be stuck with them. The Shawn story often took center stage at these self-administered talk therapy sessions. 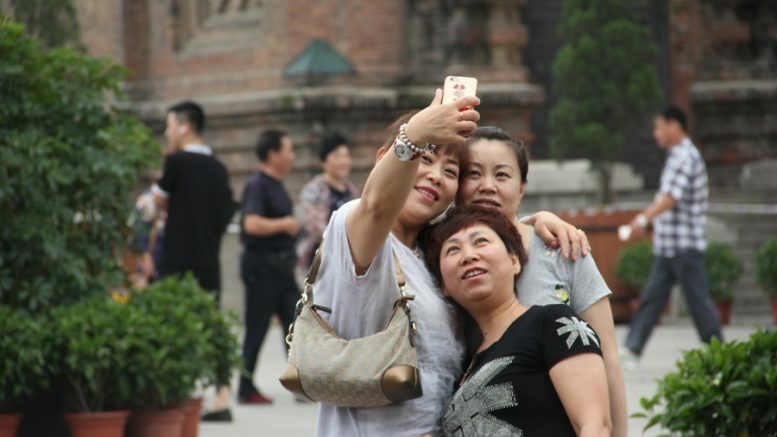 “Many of these mainlanders you have to put up with at work, they were teenagers when the Cultural Revolution happened. Having witnessed – maybe they even participated in – the ruin of so many lives, they couldn’t have emerged from the chaos of that decade without living under the shadow of ‘there but for the grace of God goes I.’ Even though you’re not privy to what they’d seen or done at that time, you can use the psychological toll Shawn’s close call with death exacted on him to imagine the movement’s impact on them. Those mainlanders’ liking for, say, toppling schedules at the last minute and seeing you and others scurrying around arranging things anew – such quirks may be to them the equivalent of Shawn’s hatchet, one of the arsenal of psychological tools they carry around to defend themselves against the phantom fear of being a victim. Back when I was in the trenches of working for mainlanders, such self-talk – efforts to curb my loathing of them by putting myself in their shoes – enabled me to gather the strength to show up for work the next morning. But what began as a workplace survival skill must have re-wired my mind’s circuit, for these days, unlike many Hong Kong people, I react to news items depicting rude behaviour exhibited by mainlanders not with glee but with sympathy. I can see with greater clarity that a lot of the times, their “rudeness” is a preemptive strike against forces that are inexplicable to them. They only need peer behind their defenses a little to realize they are actually reacting to some half-remembered turmoil from the distant past that their government compels them to bury. 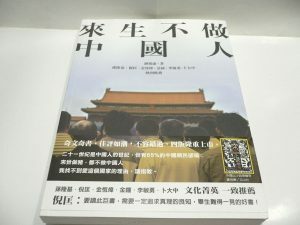 A controversial book, “No Wish to be Reincarnated as Chinese” (來生不做中國人), causes a stir among Chinese people. Later in life, Shawn’s son Allen Shawn did his share of peering behind his defenses as he tried to make sense of phobias that his father had passed onto him. Interestingly, mainlanders could have said of their country what Allen Shawn said of his upbringing: “I felt that huge passions and angers that somehow couldn’t be mentioned were seething within the house and that the world was raw and crude but had to be referred to politely in perfect sentences.” Sadly for Shawn, despite his diligent soul-searching, his phobias remain as debilitating as ever, and he entitled his memoir “Wish I Could Be There” as a way to convey his sorrow over the people he would have met and the places he would have visited had it not been for his fear of elevators, tunnels, subways, open parking lots and fields – basically, any closed or open space. In any case, he’s still luckier than mainlanders. The self-reflective ones among them would probably have set their hearts on something even more unattainable: they would have had – here I’m citing the title of a polemic on the slavish mentality of the Chinese that caused a stir some years ago – “No Wish to be Reincarnated as Chinese” (來生不做中國人). They would have laughed knowingly at the book’s title, too, only to have their chuckle checked upon realizing that even this stab at levity is off-limits – the prevalence of bootleg copies circulating in mainland notwithstanding, the book is officially banned in the country. Be the first to comment on "How I came to not despise rude mainlanders"